For all you work horses out there Mike Anderson Chevy Commercial Truck Center serving Merrillville and Gary, IN has many vehicles to serve you a large range of business needs from construction, delivery or simply satisfy your daily commute. Come in today and test drive a new Chevy Silverado, Colorado, Express or City Express Van! At Mike Anderson Chevy located in Merrillville, IN is just a short drive from Gary, IN and has been serving many surrounding communities with brand new and slightly pre-owned vehicles for several decades. We know and understand the daunting needs of the commercial worker and have many new and used vehicles on our inventory lots that will meet and exceed the expectations of our business owners. We have many Chevy Silverado 1500s, 2500HDs, 3500 HDs, Chevy Express Vans and Chevy City Express Vans that will serve our fellow commercial business owners needs well. Depending on if you desire an enclosed or open cargo area, off-road capability and extra towing capacity we will help you decide if you require a pickup or cargo van. Our expert sales professionals will be able to help you select the vehicle options and features that will deliver the best fit to meet all your business objectives and give you the optimal commercial vehicle to suit your needs. Each commercial vehicle on our inventory lots has specific features and available options you can choose to customize an exact fit so you can drive away knowing that your new commercial vehicle will deliver your business the ultimate work experience for you and your customers. Take that short sixteen minute drive from Gary, IN into Mike Anderson Chevy’s Commercial Truck Center in Merrillville, IN and get a custom fit commercial vehicle just for you and your business today! The Chevy Silverado can be customized in several different options for your business as a commercial vehicle and at Mike Anderson Chevy we make sure to cater to your asking. We have on our lots the standard Chevy Silverado 1500’s which are extremely reliable and have a high safety rating with the NHTSA with a super strong steel cage and three hundred and sixty degree air bag system. We also carry the Chevy Silverado 2500 HDs and the 3500 HDs which are the super high strength models with four hundred and fifty five horses and nine hundred and ten lb. ft. of torque under the hood with over twenty three thousand lbs. of towing capacity so you can super charge your business with this work truck. There are other options at Mike Anderson Chevy that our sales team can order for you such as the 2018 Silverado Chassis Cab with different customized features and options for your commercial vehicle purchase. Come on into Mike Anderson Chevy and talk to one of our highly professional sales consultants today about our line of commercial Chevy Silverado pickup trucks. We are only a short trip from Gary, IN and well worth that short drive! The mid-sized Chevy Colorado is just a step below the full sized Chevy Silverado but in size only. The Colorado comes standard with a rear backup camera, has been awarded best in its class for fuel efficiency at over thirty miles per gallon, over three hundred and eight horsepower and towing capacity of almost eight thousand pounds. The standard safety and technology features are outstanding on the Chevy Colorado and it also has plenty of leg, head and cargo room for passengers, work crew, storage, tools, materials or whatever you plan to bring along to the worksite on any given day. The Chevy Colorado may be mid-sized but there is nothing smaller about it by any means. It does a huge job for a smaller amount of cash but gives you a larger payout in the long run, even Kelley Blue Book agrees, and awarded it with the 2017 five year cost to own award. You have to test drive the new Chevy Colorado at Mike Anderson Chevy in Merrillville, IN to believe it! We are only a short drive from Gary, IN where you can own your next commercial pickup for less! Whether you are people moving or cargo moving Mike Anderson Chevy has the commercial van that’s right for your business. Our Chevy Express Cargo and Passenger Vans are a complete framed van with lots of cargo or passenger room in the rear, tons of standard technology and safety features, a max payload of over four thousand three hundred pounds and a powerful V8 engine that gets great gas mileage so you are not stopping at the pump all the time. The passenger van comes standard with a rear backup camera, was awarded Vincentric Best Commercial Class in America and has seating for up to fifteen passengers to sit extremely comfortably. 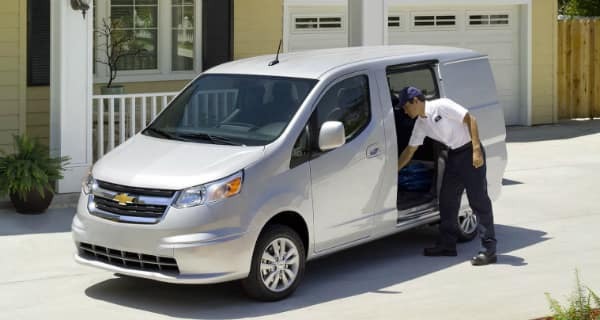 The City Express Van has over one hundred and twenty two cubic feet of cargo space, gets over twenty four miles per gallon and a turning radius over thirty six and a half feet. These Commercial Express Vans turn your business vehicles into your mobile offices so get into Mike Anderson Chevy today and test drive one for yourself you will not be disappointed. Why buy from Mike Anderson Chevy in Merrillville, IN? Mike Anderson Chevy has been a family owned business for decades and wants to make you a huge part of our dealership family. We take great pride in our customer service and our commitment and giving back to our local and surrounding communities. Come in to Mike Anderson Chevy and see what becoming a part of the Mike Anderson Chevy dealership family can do for you! Mike Anderson Chevy’s business is people first and that is our commitment to you and our promise is our service to our community, always!